VR. We were passionless until we tried it! We were clueless! We stumbled through a shady side door. What a lucky coincidence that we were introduced to this before the rush started. When talking interactive 3D then VR is a no-brainer: It’s the obvious solution for too many user interface related barriers, crutches, design flaws that have bugged creators since the days of 3DFX. It’s the holodeck becoming reality (albeit without the touching). To blame for our excitement is first and foremost HTC and Valve, who have done a marvelous job in delivering the first truely satisfying interactive VR-experience for a non-geek crowd: The room-scale setup allows us to roam virtual worlds and direct our interaction with its inhabitants using our own physical bodies. The space is limited, yes, our hands are tied to controllers, yes, but even with those constraints there’s a universe of exhilarating new experiences to be had. We can only hope that the amazing progress in VR technology during the last 2 years is fueled by an ever growing audience for the years to come, so we see Moore’s law hold for this beautiful technology. We’ll do our part, so stay tuned. Happy to announce the meQuanics project has launched an ambitious Kickstarter campaign to raise funds required for a high-quality touch-device game release, scheduled for 2017. Posted by Klaus on January 12, 2016 in Uncategorized | Comments Off on Going to Mars!! We are going to Mars! With you. And all you need is a smartphone! From January 2016 Zentrifuge is partnering with Tokyo-based artist Joseph Canouil for bringing Mars ’31 (working title), a casual mobile game to Android and iOS. We’re excited about this opportunity to bring the adventure of finding your way on the beautiful but seemingly barren “red planet” to the fingertips of the demanding casual gaming audience. In collaboration with independent artists, we have begun developing the technological framework for a series of real-time interactive artworks (based on Unity game engine) which aim to explore application of physics-based procedural 3D character animation techniques for progressive interactive digital content. For reasons of thematic discrepancy from Zentrifuges core business however we can not provide any more details on this project here. We are proud to have been selected to develop a browser game introducing Kinko.me, a revolutionary easy-to-use email encryption box developed by a Germany-based start-up since 2013. The game is to illustrate Kinko.me‘s novel take on the controversy around governmental surveillance and citizen rights to privacy, surfaced as a result of the Snowden leaks. The game is to be released in early September this year as part of the product’s official crowd-funding campaign. From July 2013 Zentrifuge is supporting the development of iCO2, the eco-driving simulation developed by the Global Lab Project at the National Institute of Informatics, Tokyo. We are contributing game design know-how to make iCO2’s highly realistic content more accessible and engaging for casual users. Zentrifuge is proud to have been requested to undertake the porting of the QBlocks application to Unity3D. 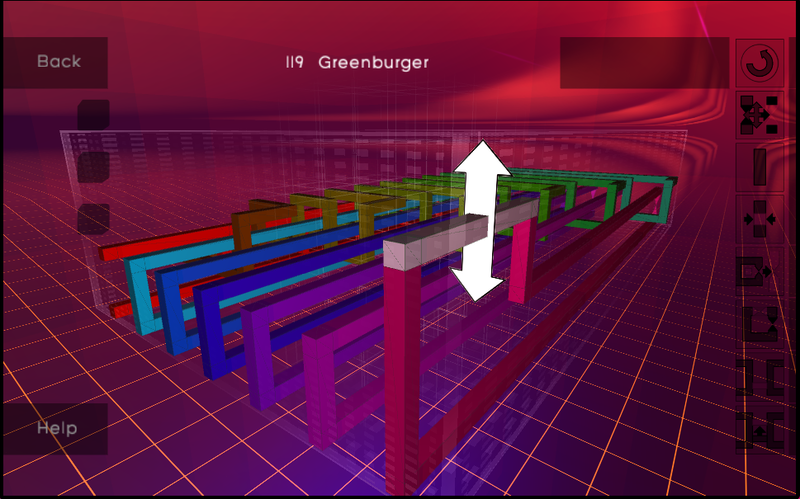 QBlocks is a game-like interface allowing to playfully modify circuits to be deployed in future Quantum-Computer architectures developed by the QIST Group at the National Institute of Informatics, Tokyo. Along with porting we will introduce UI refinements to achieve a more casual user experience. Zentrifuge is proud to present a playable preview of meQuanics, released Tuesday this week after an official press conference was given at NII Tokyo. Since then the project has been picked up by domestic media and our social media presence is quickly accumulating followers. We thank all supporters and feel all the more encouraged to turn the game into on of the most integrated serious casual gaming experiences out there. Play the game at www.mequanics.com .